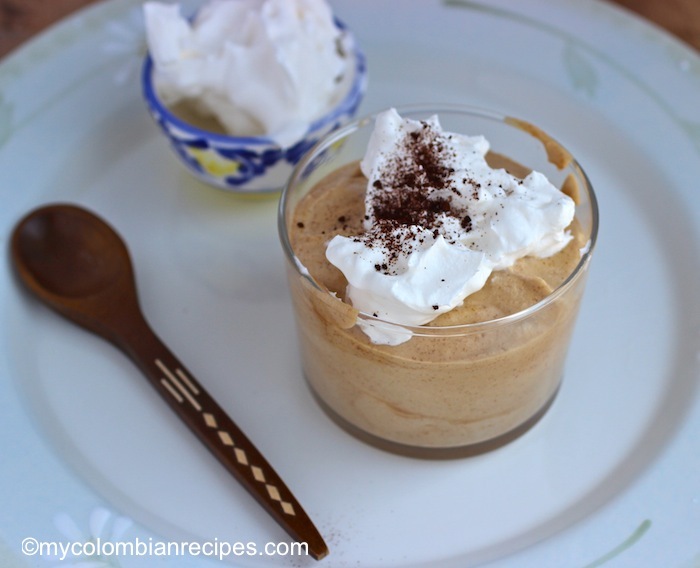 Last week I was craving a creamy coffee mousse known as Esponjado de Café in Colombia. 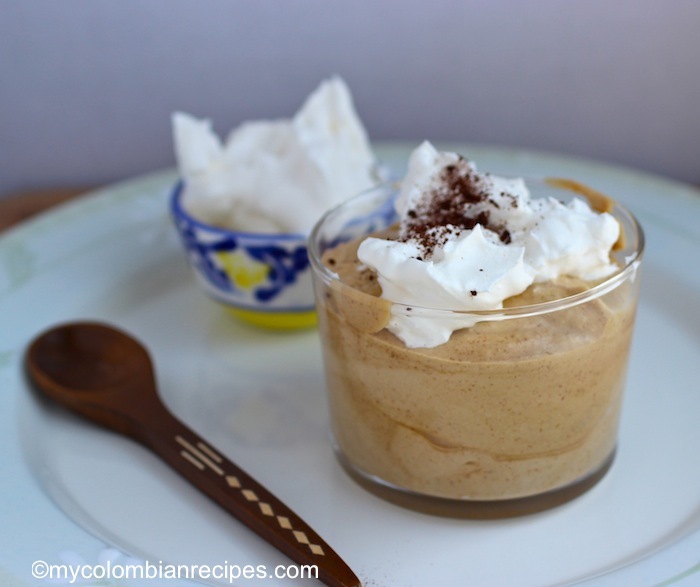 Esponjado is a traditional and popular Colombian dessert with many variations such as lulo, curuba, orange, lime, passion fruit, coffee and more. 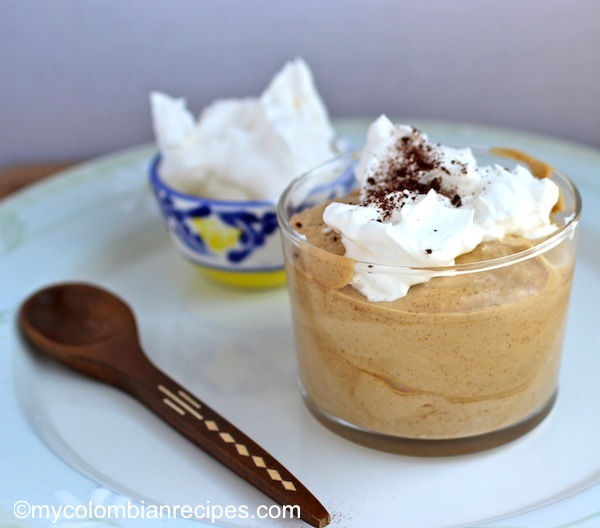 Esponjados are usually made with egg whites, whipped cream, condensed milk and your choice of fruit. I love making esponjados for dinner parties particularly because make-ahead desserts are a lifesaver when you’re feeding a group. 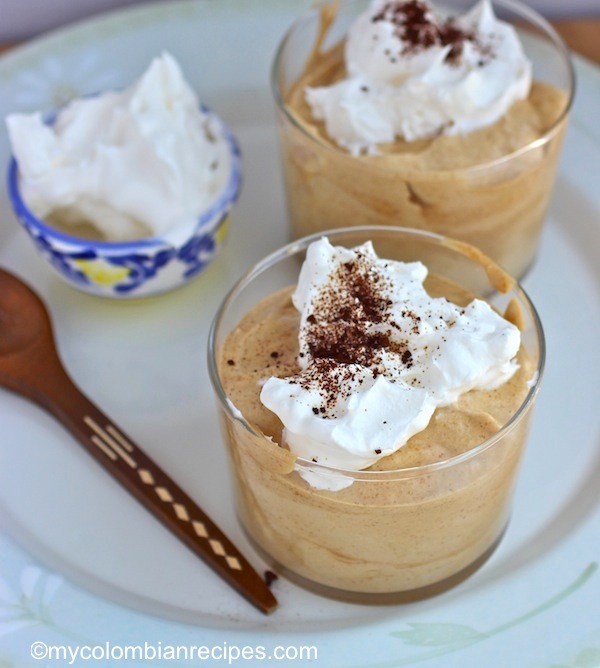 If you have a big group of coffee lovers coming over, definitely whip up this dessert! 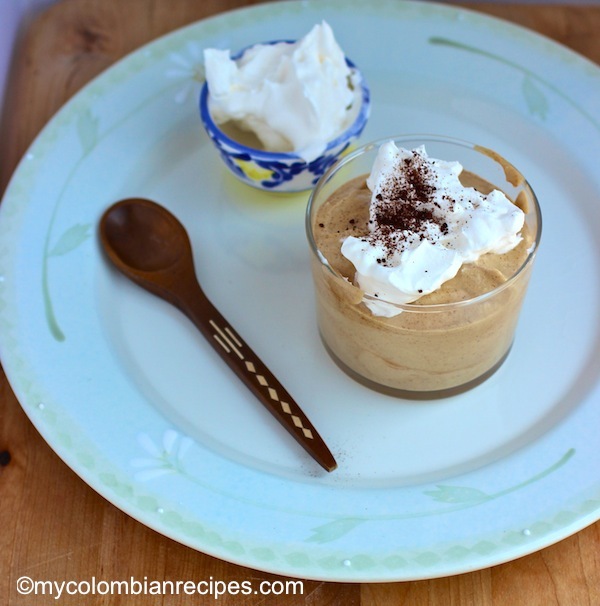 This Esponjado de Café ( Colombian Coffee Mousse) is light and airy and has the perfect mousse sweetness and texture. Once it is chilled, the esponjado sets up and can be piped as a frosting on cupcakes or cakes, can be used as a filling in pies or tarts, or eaten as is with a dollop of whipped cream and chocolate shavings or fruit. Bring the water to a boil in a small pot then remove from heat. Mix 2 tablespoons of water with the coffee in a small bowl. Mix 3 tablespoons of water with the gelatin in another small bowl until the gelatin dissolves. 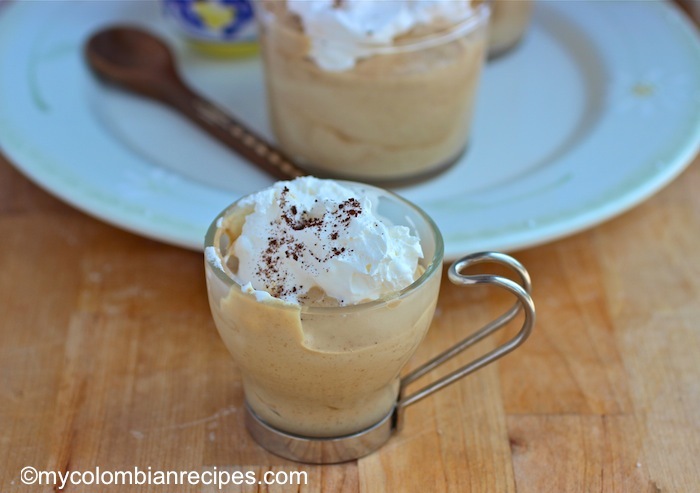 Place the coffee mixture and condensed milk in a blender and blend for about 2 minutes. Add the dissolved gelatin to the blender and blend for 1 more minute. In a medium bowl, using an electric mixer beat the heavy cream for about 3 minutes. 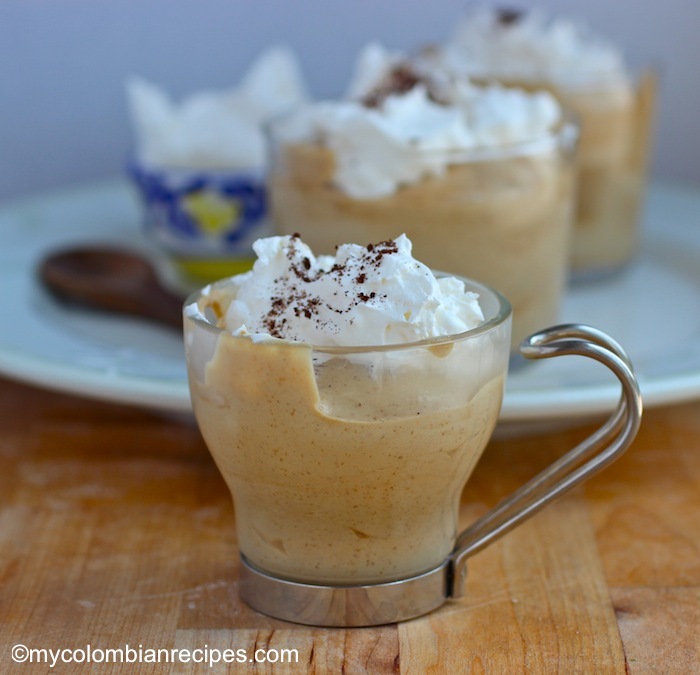 Fold the whipped cream into the coffee mixture. Using an electric mixer beat the egg whites and sugar in a clean bowl until stiff. Add half of the egg whites to the mixture, gently folding to incorporate them. Don’t overwork the mixture. Add the rest of the whites and fold the mixtures together. Spoon the mixture into individual serving glasses or bowls and refrigerate for about 5 hours or overnight. 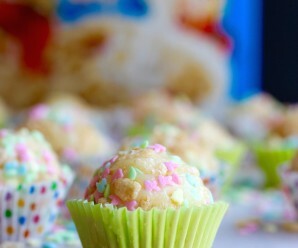 Serve with whipped cream and grated chocolate on top. It looks soft, creamy and light! A lovely dessert. Que rico se ve. Do you think i could use cool whip or maybe light cream? 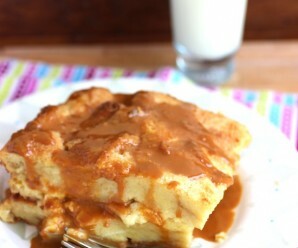 Also, I just thought of this…substitute condensed milk with dulce de leche to give it a caramel twist. They’re about the same consistency so it would prob work, right? I might just try this all tonight…because I’m a sugar-holic. Oh I have not had mousse in too long and I love coffee. 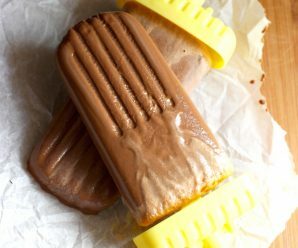 So cool is can be piped as a frosting once cooled. Can you refrigerate themousse for two night? And can you pipe the whipped cream the night before you serve? Thanks! Love your recipes! Yes, but cover it with plastic. If you use sweetened condensed milk do you have to reduce the sugar amount and by how much? Thanks! 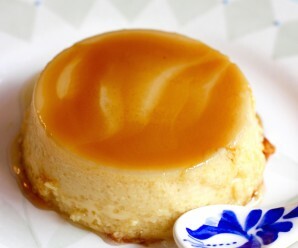 Hi Alina, I used sweetened condensed milk. You don’t have to reduce the sugar, just follow the recipe.